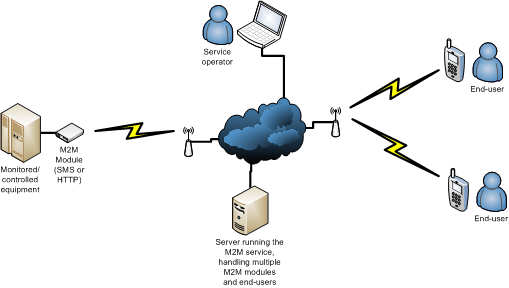 Machine-to-Machine (or M2M) communication is a crucial part of the expansion of the Internet or the Web to also equipment. Some even say it’s part of Web 3.0, that’s also being called “The Internet of Things” (IoT). Not that it really matters what buzzword you use. The point is: There will be a heck of a lot of devices communicating wirelessly and on their own with services, other devices and people. That’s a promise! The terminal part of an M2M solution often supports GPRS/3G/4G, but increasingly also other radio technologies like LoRa that are much more power efficient. As mobile radio and the Internet are being used, the M2M modules, the services, the service operators and the end-users can be anywhere in the world. Kind of like is shown in this diagram. Working with M2M related projects is part of Abiro’s business, primarily in terms of feasibility studies, project definitions, project management etc, so if you are interested in getting help with that, please let us know.